The iRig Voice comes bundled with the free EZ Voice app, which lets potential Celine Dions sing along with/murder any tune on their phone, and record the results. 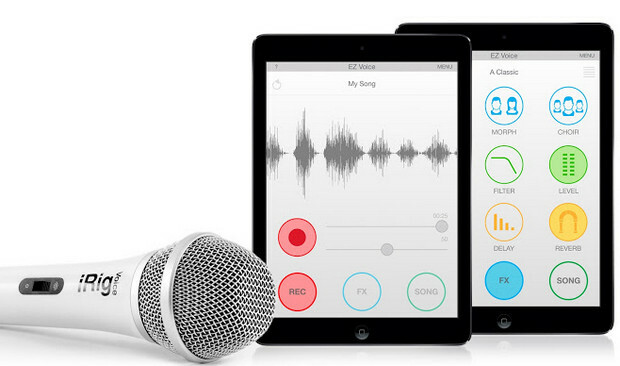 The mic is designed as the ‘perfect companion’ to popular singing and music apps like IK’s EZ Voice and Smule’s Sing! Karaoke and AutoRap, plus The Voice: On Stage by StarMaker, musiXmatch, Karaoke Anywhere by JoltSoft and more. Using a unidirectional cardioid design, the iRig Voice is tuned for optimal vocal frequency range reproduction, and has a handy on/off slide switch for quick muting. The mic connects through the microphone/headphone jack found on all iOS and Android devices providing a stereo output to connect headphones or earbuds. Vocally challenged belters can add effects like reverb, chorus, pitch correction to improve their warbling tones, with the option to share their performances via email or SoundCloud. Available in Green, Blue, Yellow, Pink and White , the iRig Voice costs $39.99/€29.99 (excluding tax). “tuned for optimal vocal frequency range reproduction” = manufacturer-speak for ‘cheap’.